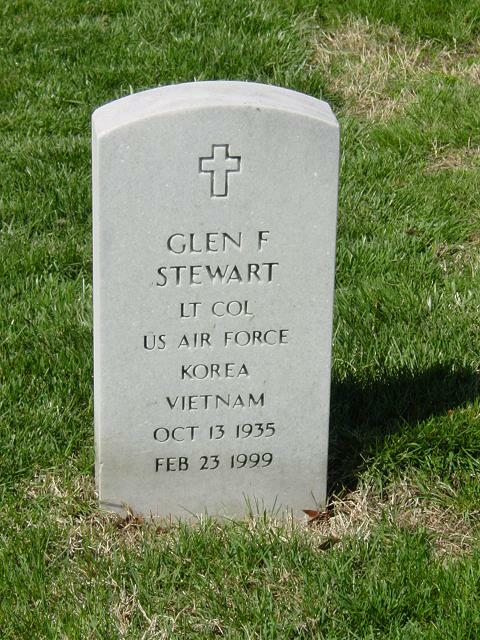 Retired Lieutenant Colonel Glen Franklin Stewart, 63, of Arnold, Mrayland, died Febebruary 23, 1998. He was born October 13, 1935, in Dallas, Texas. He entered the Air Force in 1957. He was an intelligence officer and electronics warfare officer during his career and worked for the National Security Agency at Fort Meade, Maryland, until he retired in 1974. His awards and commendations include the Meritorious Service Medal, Air Force Commendation Medal, Air Medal with two oak-leaf clusters, Armed Forces Expeditionary Medal (Cuba), Air Force Outstanding Unit Award with one oak-leaf cluster, Air Force Longevity Service Award Ribbon with one silver oak-leaf cluster, National Defense Service Medal, Master Navigator Badge and Joint Service Commendation Medal. He is survived by his wife, Rowena Stewart of Arnold; a daughter, Glenda Kay Stewart of Fairfax, Virginia; a son, Stephen Stewart of Arnold; a stepson, Ronald Gupton of Las Vegas; a stepdaughter, Cindy McKeon-Gupton of Annapolis, Maryland; a brother; and eight grandchildren. Services were held March 31, 1998 at Arlington National Cemetery, Virginia.